Deacon colored this picture today at school. It's amazing how something like a colorful turkey can make me stop and realize how much my baby isn't really a "baby" anymore... I mean, wasn't it just yesterday when he was happily scribbling all over the page with no regard to lines? Today I watched him and he was so aware of the lines and so deliberate about what colors he was choosing. And when papa told all the kids to get their names on their page, he wasn't one of the little kids lining up to get help... he just took the crayon and wrote D-E-A-C-O-N with no help at all. Slow down baby boy... mommy isn't ready for you to be such a big boy quite yet. 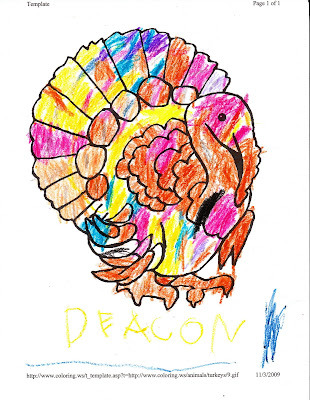 Good job on the turkey Deacon. That's an awesome picture. Deserves a frame Mom.